The appointment of Dino Apolonio as general manager of People's Television has officially been announced Friday via the network's news programs. Dino, who previously served as vice president for broadcast operations of TV5, is taking over the position vacated by Albert Bocobo, who in July tendered his courtesy resignation to President Rodrigo Duterte through Presidential Communications Operations Office head Martin Andanar. 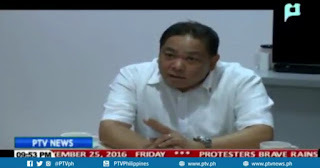 News about his appointment had long been expected following Andanar's announcement in July that he would be courting his former TV5 colleague for the said post. Aside from Apolonio, other TV5ers who were recruited in recent weeks for top posts at the state-owned network were former reporter Wheng Hidalgo as the new news operations head, and former news desk editor Jerome Manahan as news desk head. Apolonio is a longtime broadcast engineer who previously worked for American broadcast networks such as NBC, ABC and its affiliate KXTV Channel 10 in Sacramento, where he served for 12 years.